In the Presets window you manage all your encoding settings. 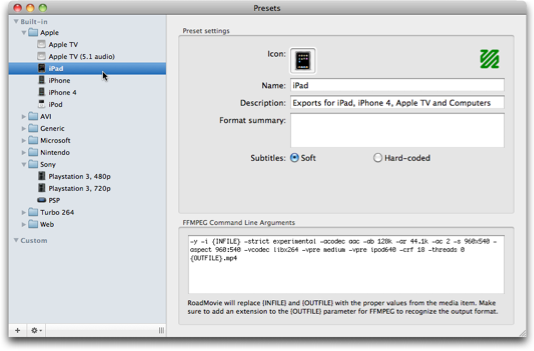 RoadMovie uses FFMPEG (built-in) or QuickTime to encode your movies. You can quickly see which one is used for a particular preset by looking at the icon in the upper right corner. You can choose if your preset will use Soft subtitles or Hard-coded subtitles. Soft subtitles will be the perfect choice for any Apple device like the iPad, iPhone, iPod or Apple TV. Hard-coded subtitles will “burn” into the video track and will play on any device like a PS3 or Nintendo Wii for example. It’s easy to tweak existing Presets for your special needs. Just duplicate one of the built-in ones and start changing the paramers/settings. You can learn more about the FFMPEG command line arguments by visiting the FFMPEG documentation page.